Black Forest is a unique small-town community that is just next to, but a world apart from, the city beyond. Foreclosures are uncommon here, however when one comes along it is a lucky person that snatches it up. The area is made up of almost exclusively single family homes on large, mostly horse-zoned lots. Lots can be either covered in pines or in meadows framed by the forest; or a combination of both. Black Forest has everything from upscale, gated communities like High Forest Ranch, Cathedral Pines to the veritable 'cabin in the woods' (with all the modern amenities) in neighborhoods like Black Forest Reserve, Highland Park, Pine Cone Ranch and Camelot. Neighborhoods like Cherry Creek Crossing, Forest Green, Abert Estates and others offer sweeping meadows among the pines with spectacular mountain views. Black Forest personifies the Colorado Lifestyle at its best. Many of the neighborhoods like Cherry Creek Crossing and High Forest Ranch feature their own network of parks, paths, fishing ponds and community areas that foster family growth and interaction. Beyond the neighborhood two regional parks, Fox Run and Black Forest Regional Park bring all of the communities together and are connected to an intricate trail network that is part of the Colorado Springs Trails network. While many of the properties in Black Forest are very secluded, there are still several metropolitan areas that serve residents here. Eastern Black Forest is just a few minutes from Falcon shopping areas, the southern portion is close to the Powers Corridor and the western portion is served by Northgate shopping centers as well as Jackson Creek and the Tri-Lakes area. Black Forest is served by three different school districts. The eastern portion is part of Falcon School District 49, and most of the students attend Falcon High School. Southwest areas are served by Air Academy District 20 and students attend Air Academy High School. 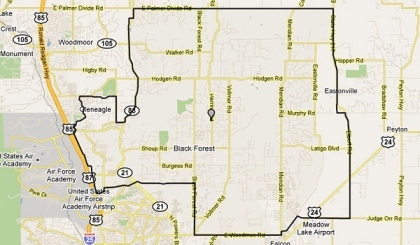 Northern portions of the forest are within Lewis-Palmer School District 38 boundaries. All three of these districts are highly acclaimed with some of the best schools in the state. Also, with the Air Force Academy just to the west, this is a popular area for cadets and Air Force personnel. Black Forest invites you to live the Colorado Lifestyle to the fullest. Amazing properties, proximity to metropolitan areas and some of the best schools in the state means that a foreclosure here is a great find! Click here to search all Black Forest homes for sale.